The Queen of Cups is nurturing – caring – compassionate and sensitive. She is a beautiful, introspective woman who sits on a throne at the edge of the sea. She holds the closed cups, an indication that her thoughts are originated from the unconscious, from the depths of her own soul. The stone throne upon which she sits is decorated with images of sea-nymphs, fish, and scallop shells. The sea and fish are symbols of the unconscious mind and water in general represents emotion, spirit, and feeling. Her feet do not touch the water; they rest comfortably on colorful rocks washed up in front of her. 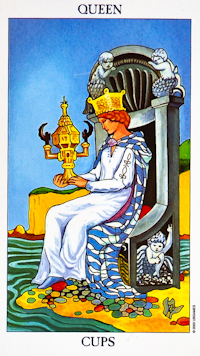 The Queen of Cups is very intuitive; she is the pure force of Water, and her connection with the subconscious is rivalled only by the High Priestess. The Queen of Cups tends to think with her heart, rather than her head. And, she may lack common sense and rationality but she is highly intuitive and sometimes psychic and dreamy. Similarly, if you are finding that the logical approach is not working, then the Queen of Cups encourages you to follow your heart and not your mind. You may be required to turn inward and explore your emotions about a particular situation.